Preparing for a test can be harder than taking the test itself. Finding a study method that works for you and imagining how it will be applied in test format can be a challenge, no matter what the topic. Studying for the VCP-Cloud exam is certainly no exception. Through the VCP-Cloud practice test from MeasureUp, you have the opportunity to practice your test-taking skills using tools that provide an accurate simulation of the exam. 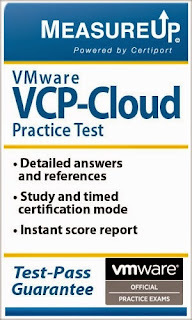 The VMware VCP-Cloud practice exam by MeasureUp, the Official VMware Practice Test, provides an easy to use practice test format. Throughout the mock assessment, you will be allowed to review and build your knowledge through the test’s detailed answers and references, study and timed certification modes with instant feedback on how you performed. With 30 day online access, you will have access to this practice test for 30 days from the date you activate the practice test on the MeasureUp platform. The activation code is good for one year from date of purchase from VMware Certification Marketplace. Candidates seeking VCP-Cloud certification are typically infrastructure personnel who have worked with vCloud Director Implementations from anywhere between three to six months. They should know how to install and configure ESXi hosts and use the VMware vCenter to monitor, manage, troubleshoot and administer virtual machines. These topics are also covered in the practice test. After purchasing the MeasureUp practice test, which you can purchase here, your chances of success on the actual exam will grow immensely. You will be provided with the knowledge needed to pass, while simultaneously decreasing test anxiety. Be confident and prepared for the next big step in your virtualization career! The guys here know everything about writing. Thank you for the useful article. You are noticed many interesting things and that is why I think you may have interested in https://breezewriting.com/speech-writing/ the resource. It is the platform of professional writers who like the work enough to help others with writing tasks. They always finish on time and write on the high level. Now I am happy to know them. Good blog.This is a comprehensive and helpful piece of information.